George Leopold, a frequent contributor here, is one of those who would hold we’re underinvesting in Earth observations, science, and services. His most recent contribution, which like Mr. Jones’ comment came in more than a week ago (my apologies, George! ), evokes an understanding of an Earth beyond price (the reference to motherhood… and possibly apple pie?) and under stress. I’m quite a bit more sanguine than George about our future prospects, but he and many other thoughtful people (including Mr. Vonnegut, whom he cites) can certainly be forgiven for being pessimistic. Twenty-four human beings have seen the whole circle of the Earth, the two-dozen Apollo astronauts who flew to the moon in the late 1960s and early 1970s. Some of these macho test pilots (there was only one scientist, geologist Harrison Schmitt) wept when they looked back at Earth from the lunar surface. This innate love of the Earth is of course within all of us. This small blue dot is our home, the only one we have in a universe whose size we can’t begin to comprehend. The lesson of the Apollo program was that we had to leave our home planet in order to truly appreciate what we have here on Earth. 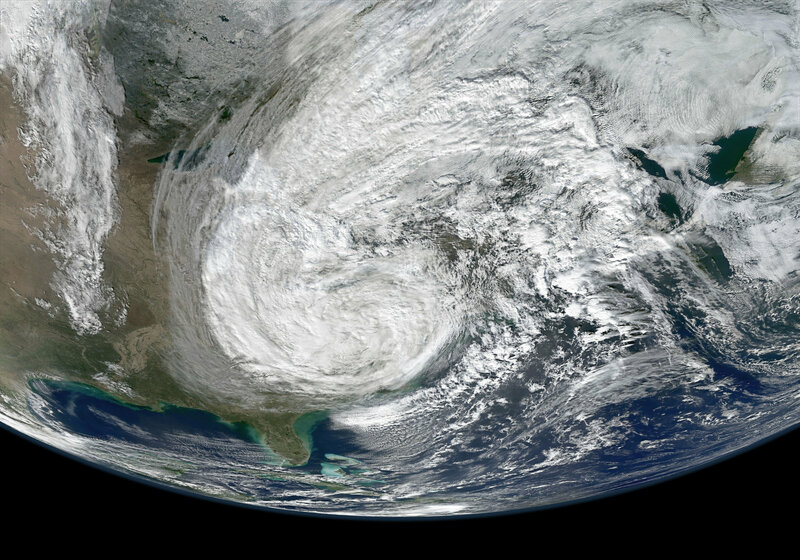 Hurricane Sandy slams into the northeastern U.S. on Oct. 30, 2012, as seen in this orthographic projection from NASA’s Suomi NPP satellite. Yet we continue to dump on our mother. Veteran astronauts have noted that the large cities seem to have their own unique atmospheres from orbit. And over the years, it’s only gotten worse. There is growing awareness of the problem thanks to the machines that continuously monitor planetary systems from Earth orbit, or during close encounters like the Mercury Messenger flyby in 2005. What these images provide is a God’s-eye view of the true cost of human activity on our home planet. Despite the stark beauty of Earth suspended in the void, these are not pretty pictures. Most of China covered in air pollution (my first sensation upon arriving at the old Beijing airport was the smell of burning charcoal), deforestation, a great section of Greenland’s Petermann Glacier breaking off and drifting out into the open ocean. Regular readers of Bill Hooke’s blog could cite many more insults to the Earth. Some of the more insightful of the Apollo astronauts also noted how fragile the Earth appeared in the blackness of space (darker than the blackest black you could ever imagine, astronaut/geologist Schmitt recalled). Pictures don’t lie. The irrefutable photographic evidence of humanity’s abuse of our planet should spur us to set aside our petty differences and redouble our efforts to protect our home. Shortly before he died, the novelist Kurt Vonnegut passed judgment on the human race. Vonnegut was a fatalist, having survived by pure luck the fire bombing of Dresden near the end of World War II. Earth will ultimately reject our species, Vonnegut concluded. This is undoubtedly true if we continue on our present course. The same is true for our species, and our home planet.